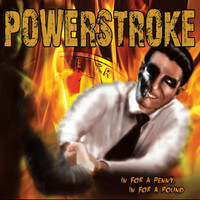 Belgian’s POWERSTROKE basically sound like a huge barrel of groove laden fun on their third album In for a penny, In for a pound. Well, that’s pretty apt. I’ll raise a glass to that. Although I will say, God this band do remember the 80s. They’re not afraid to bring out the solos. And they do have shades of TESTAMENT in their riffs and their style. And they have song titles like “Until The Fat Lady Sings” and “The Queen of Mean! ” Yeah, they do!! As you would expect, POWERSTROKE are loud, primal, fast, clichéd, powerful, groovy as f**k and most of all, they sound like they’re having a great time. It’s the soundtrack to stumbling from one seedy dive bar to the next leaving a trail of chaos. The songs are horrendously catchy and instantly get stuck in your head. Singer Maarten Geeraert, despite being Belgian, does a pretty good Southern Rock voice too, which is actually pretty cool. Not they sound like this band, but I also think they give someone like STEEL PANTHER a run for their money in having choruses you can instinctively chant along to, fist raised joyously in the air at the end of the night at a rock club when you’re royally pissed, stuck to the floor and ready to go home with just about anyone. Alright that’s enough from me!! Now, where’s my beer??? Keep on strokin’ the power!! !